September Recap + $100 Pottery Barn Gift Card Giveaway! Entry couldn’t be easier – simply leave a comment on ANY post during the month of October and you are automatically entered! More comments = more chances to win! THE CONTEST WILL END ON OCTOBER 31st AT 11:59 PM EDT. My September was mostly consumed with all things fall! In case you missed any of it, here’s a little of what I was up to. The whole time that I was working on my dining room makeover, I was thinking about how much fun I was going to have decorating it for the different seasons and holidays! Do you have spaces that you actually get excited about decorating? Seasonal decorating sure can be time consuming, so I’ve come up with a way to make it fast and simple! To a lot of people, a front porch is kind of like having a living room when you already have a family room. You know what I mean – a space that you want to be pretty, but not one that you really use. That isn’t the case for us – Pookie and I love to spend time on our porch! Friends, you don’t want to miss out on this delicious version of baked apples! « A Vibrant Teenage Girl’s Bedroom + A Giveaway! I love your decorating!! Inspiring!!! Thank you for the beautiful ideas. Your pictures are inspirational! I love your urn decorations…..I am moving to my new home today and have already borrowed your urn ideas! Thank you and keep them coming……(I can hardly wait to see your Christmas decorations)! I enjoy your posts & the pics of your beautiful home. Thanks for your beautiful Fall posts. You have definitely inspired me in my own home. I love you post! I’ve got to buy some honeycrisp apples this weekend and may your baked apples. Welcome fall!!! This has become my favorite blog. Your choices are so lovely!!! Thanks for sharing these wonderful ideas! You must know by now cozy is how your home makes me feel. Seems I use that same word with each comment I leave. Your fall decor adds to the feeling in my opinion. I made the baked apple recipe last night. Yummy! Suzy, once again I’m inspired! Thanks so much for sharing your home and ideas with us! I want to come live at your home – beautiful!! Thanks for this great giveaway opportunity, Suzy! And thanks for such great decorating inspiration! YUM!! Honey-crisp apples look divine – can’t wait to try! Lovely decor! Can’t wait to try the recipe for Honeycrisp apples. Your blog is my absolute favorite! Now you know I love me some Pottery Barn!!! How fun! We love Pottery Barn and all the affiliates! Thank you! Have so enjoyed all your fall posts. They are jam packed with inspiration and eye candy. Love your front porch. Your dining room is quite pleasant. I especially like the wall shelf and the scales with the pumpkins sitting on them. I love your enthusiasm and excitement about decorating and making your home cozy. It isn’t home if it looks staged and cold. I really enjoy when you include pictures of your trips. I loved giraffe manor! 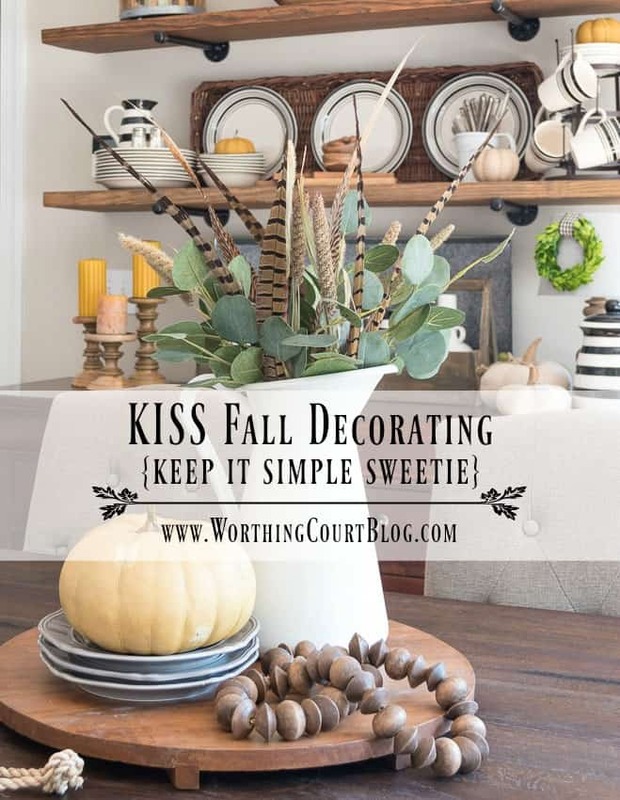 Beautiful fall decor – and Happy October to you! Great giveaway – I practically live in Pottery Barn! I discovered your blog last winter and it has been such an inspiration. Thank-you for helping me improve my home! You have beautiful style and home. I love your home and enjoy reading your blog. Would love to win the Pottery Barn gift card! Looking forward to trying some of your beautiful ideas. Time to go pick apples! Your projects are so easy and fun to complete. Keep sharing and thank you for doing al the pretty arrangements. Somehow I missed the baked honey crisp apples. Glad my son talked me into them (thru were a bit pricey) yesterday so I can try it. And WOW, a Pittety Barn Card! Fave! Your style is great! I am trying to add some of your choices to our home. I sure would have a blast with this one thanks for the chance. Your Apple recipe is to die for. Made it twice and family just gobbles them up. Thanks!!! I love your style, especially your tablescapes. Thank you! I spend some blissful hours wandering your site. I open one page after another until I am stuffed with inspiration. Your writing content and pix go well together. I think I enjoy fall decorating almost as much as Christmas. I am especially interested in novel ways to repurpose items in many homes like yours. Started to love open shelves a while ago, regardless of people in my ear about showing all the clutter. Ha Ha amateurs. Love your blog! I love how you decorate!! Love your blog…..thanks for the giveaway!!! Love the way you decorate! Your home is beautiful! Your Fall decor is all beautiful! Fall is my favorite time of year and you do it with flare! Love looking at your blog each day. I get so inspired by all the pictures. Happy Sunday! Really love your open shelves and how simply you changed them up for the seasons! I am in southern Florida and while fall here is practically non existent I am anxious to bring in some pumpkins and fall colors into our home! Thanks for the inspiration! Your home is beautiful and so welcoming. I must try to make those apples! Your dining room looks so wonderful and cozy! 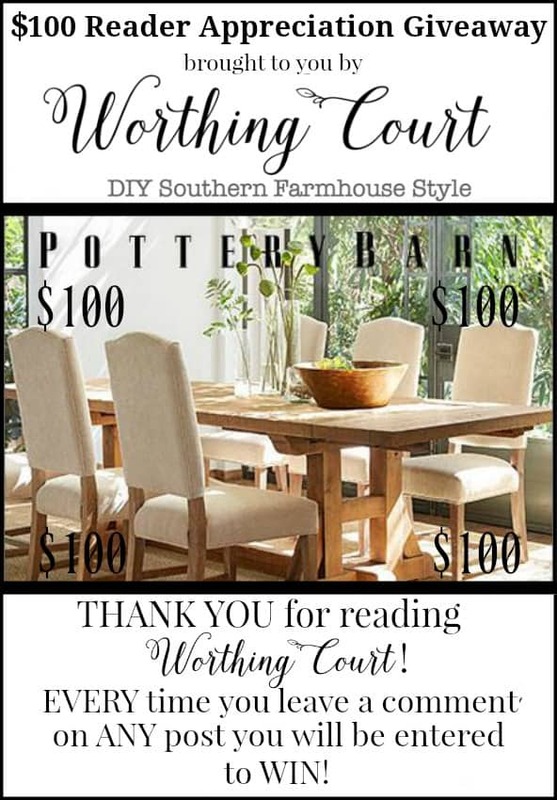 Thank you for the chance at the giveaway, Pottery Barn is my favorite home decor spot! Anything Pottery Barn is GREAT!! Thanks for sharing all of your terrific ideas for Fall decorating! The baked apples look delicious!!! Your fall decor is gorgeous! Happy October! 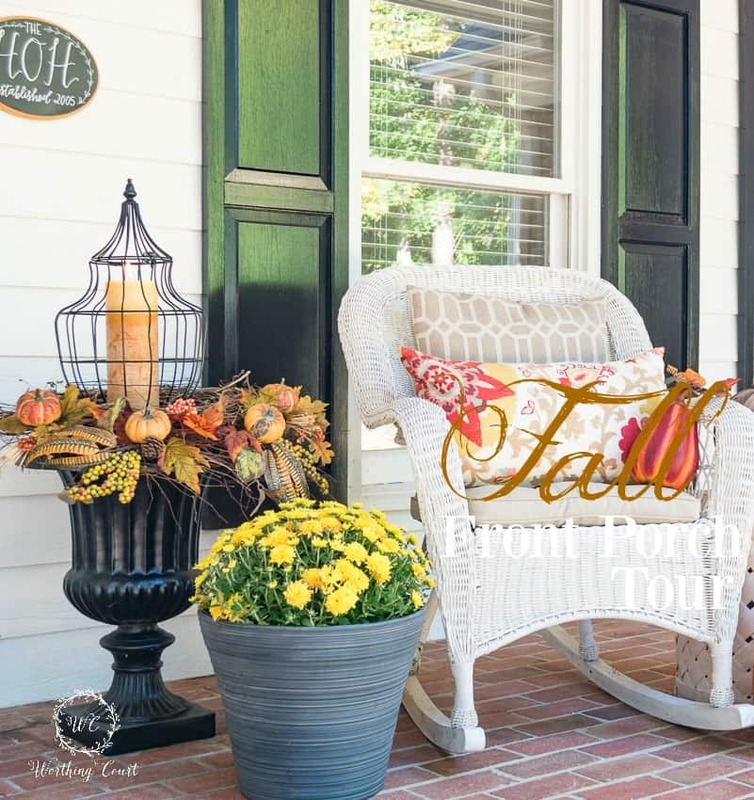 I love your Fall porch & I especially love the changes you’ve made to your new home. The kitchen is stunning. I tried your tasty baked honey crisp apples recipe tonight- delicious!!! Thanks for the recipe! Baked apples and fall go together! Next- love your blog. Thanks for making it so interesting and easy to spark some ideas for my home. Love using pheasant feathers in fall decorations! You have given me so many beautiful fall ideas to try during my fall decorating this weekend. I will also be decorating my father’s home so I need several new ideas. Love your blog! You definitely hit the “nail on the head” when you said that Honeycrisp apples are the BEST! My absolute favorite apple ever and I will pay the price. Cannot wait to try this baked apple recipe. Just signed on for your newsletter. Party on! Fall In My Dining Room speaks to my heart. I love the shelf is it made from recycled materials? Hi Candyce. The shelf is actually an old mantel that has had the long sides cut off. I found it at a thrift shop for $10! I am so inspired! On my way to stock up on decorating supplies and honey crisp apples RIGHT NOW! Thank you! I appreciate that you show examples of stunning vignettes and decorating with just a few items……..showing us that “less is more.” Thank you! Hi Suzy, I am enjoying so much your fall decorating. I can’t wait to see your Christmas decorating! Thanks so much for sharing! There is so much to love!! Hard to decide where to start first! I LOVE your front porch ideas! Thanks for the fall decorating ideas! I love the porch and the brick floor too! So welcoming for Fall. Loved the Honey Crisp recipe – so yummy, and so fall!! Keep those recipes coming! I absolutely love your dining room….it draws you in and makes you want to spend time there. Great job! The Honeycrisp apples look delicious; a perfect fall dish! I love everything you do, I wished we had more of the stores you shop in our town. 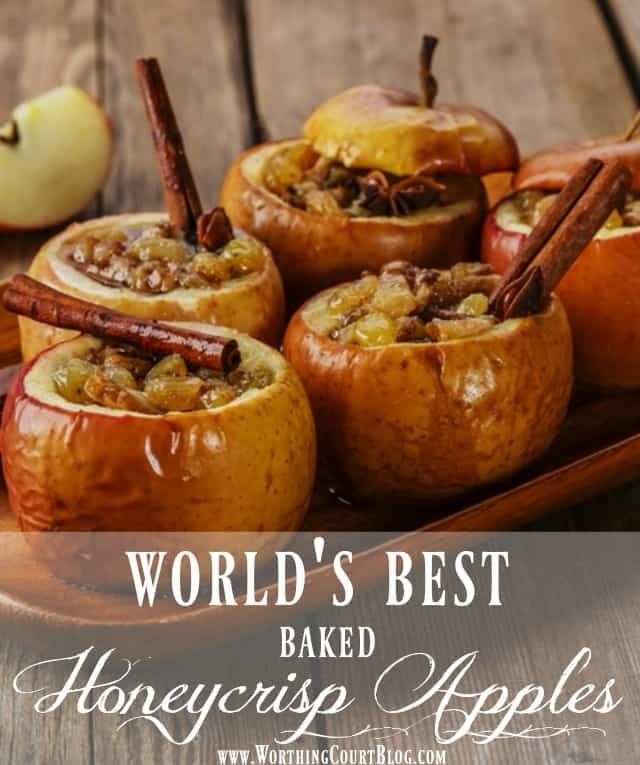 Wonderful giveaway Suzy I forgot to mention, I can’t wait to try that Honeycrisp baked apple recipe. Looks dene. Fall in your dining room is not only stylish but elegant. I love the neutral colors but have always been a little shy of trying them. But seeing your post has inspired me to mimic this beautiful and timeless palette. The pheasant feathers and the Salal are my favorite. Thank you for sharing your passion and beauty of decorating. Yummie, my apple tree is ready to pick. Have to try those baked apples. Thanks for all your design ideas and the chance for the giveaway. I happen to love Home Goods, as well. Keep up the good work and I look forward to more! Thanks for all the decorating posts. Home Goods is such a great place to get ideas . Looking forward to more posts. I love that urn on your porch! Just found your blog. Love it! I signed up to get the emails. Looking forward to seeing your great ideas with each new day. I love how you decorate with pumpkins!! They are my favorite item for Fall decorating. I plan to copy several of your displays! Thank you for sharing! I love all your posts, which is why I get them delivered to my inbox. Each post is filled with all sorts of tips and great things, I look forward to reading them. I love your style! So many things would fit perfectly into my “decor”. perfection!! Love your ideas and style!! Everything is so wonderful! I especially like the white pitcher with the eucalyptus and feathers…it is something that I can do and am on the search for those feathers! Thanks for the generous giveaway!! The apple recipes look fabulous….can’t wait to try! The apples have me drooling. I just recently discovered Honeycrisp apples. Love them to munch on, can’t wait to try the recipe! I have a huge front porch and love seeing new ideas! Everything is always so beautiful! Love the basket on your front door. I have one just like it, but not being used, it’s in the attic. I’m inspired to get it down and fix it up for maybe my side door. ( already have a wreath on my front door)… Thanks is for the inspiration. Thank you for sharing your ideas with us. Everything is so pretty and I can’t wait to try your apple crisp recipe. Love this opportunity. Thank you! Loving ALL your fall posts! Th aks for a chance to win a PB gift card. Just love all the fall ideas! Thanks for sharing! Those Honey Crisp apples look marvelous!!!! Yum and double Yum! Love all your fall ideas!!! 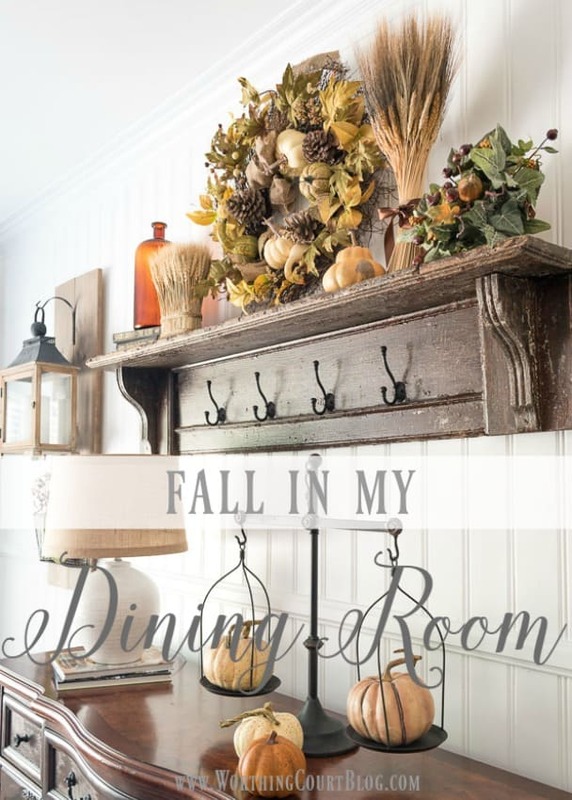 I just live your decorating style, and your fall dining room is just beautiful! I like your understated elegant style. Love your office makeover progress! I am contemplating changing my living room into a “Lady” office. You have given me lots of inspiration! Beautiful!! Simple is always best! I enjoy your fall decorations. You are a great help for me. Love your Fall decorating. I still can’t wrap my head around that Christmas is right around the corner! I love fall so much! I always look forward to decorating, dressing up for Halloween, and handing out treats to the neighborhood kiddos. Thank you for all the ideas and recipes you inspire daily!! Happy fall Suzy! Love your ideas and thanks for sharing them! Love all the Fall ideas! I’m new to your blog. I had seen it many times via Stonegable. I am enjoying it. I can’t say I have a favorite spot to decorate but I love decorating for Christmas. I do some things the same, but I try to add a new idea or two that I have seen on a blog. Fall in Florida is actually a state of mind so I bring out my decorations to remind us. Ha! I’m not sure which I like more, the natural looking autumn decorations or that mantle. That mantle belongs in MY 200+ year old house built in 1795. My family has been in it for just about 100 years. I’ve been in it almost 20 years now (I can’t believe it) after a complete renovation that it DESPERATELY needed. Eucalyptus and feather arrangement is very nice. I am in the process of making the lantern on barnwood that you have hanging on your wall. I just think it is so cute and I have some lanterns from our wedding decor this summer. I just have to do it. Thanks for being so inspiring Suzy! I love the mantle vignette. It is so fresh and welcoming. I also love the table for your office in the gray color. Thank you for all your wonderful inspiration!! I love he way you decorate your open shelves! If I could I would have them in every room but I just don’t have the wall space to do it! Thanks to your blog I am about to paint an armoire which I bought at an auction. My grandson Nicholas and I are doing this as a project together and then it will go in his room. We have andonized bronze paint already! I wouldn’t have known about this without your blog. And I showed him the pictures so he had a visual in his head. Otherwise he was asking for U.K. Blue. We are Kentucky fans after all!!! suzy, all of the pictures of your home are lovely…i wish you were my neighbor to help me achieve the same results in my home! i have on my to-do list to purchase pheasant feathers, what a striking look. Your front porch is so pretty. Such a lovely rocking chair! I absolutely love looking at all of your decorating ideas!!! Can’t wait to see more! Oh wow, those Honeycrisp baked Apples look amazing!! I can’t wait to make those for my family. Thanks for all of the Fall decorating inspiration. Love your blog! The Honeycrisp apple recipe sounds and looks amazing! Thanks for sharing and the opportunity in the giveaway! I love the use of pheasant feathers. So pretty! It is quite evident that you have fun in whatever you do. I would love to go on vacations with you. I need to catch your enthusiam. I can’t think of a room that I can’t wait to decorate. You have inspired me though. Am very anxious for your Christmas ideas; I need to change up my decorations. Your mantels are so pretty! Can’t wait to see your home decorated for Christmas. I am loving your antique mantle shelf. I have an antique mantel from my husband’s family home and no where to use it. We tried to use when we built out downsized home but builders codes said it was not wide enough. Thank you for the idea to cut and hang as a shelf. I love the scales with the pumpkins on them. So cute. Beautiful fall decorations on your porch. I love you front porch. I am needing a brick floor, now, anywhere!!! You give me so many decorating ideas! Love reading your blog! love your style…farmhouse and all kinds of cozy!!! love your porch! next year, i’m making porch sittin a priority! Thank you for this and all that you do and for being you! Good morning, it’s Jackie telling you how special your blog is!!! Happy Tuesday! I love your blog. You have such a talent and flair for decorating. I love your mantle! You’ve really inspired me to do something . We travel so much I’ve gotten lazy and haven’t done a thing. I miss the days when I went “all out”. I love the natural look of your fall decor. Thank you, Suzy! So…..I’m slightly obsessed with all of your mantel posts! My hubs and I just bought a house in February of 2015 and it is the first time in my life I have ever had a fireplace and mantel to decorate! Where has this been all my life?! Anyway, our house was all stuffy and formal style, so I am slowly transitioning it into our casual, laid back style and your blog is just kinda my go to. Hope you keep the fabulous ideas flowing for us to enjoy. Thank you! Pottery Barn has always been a favorite of mine. I could wander in that stores for hours. What a treat to have a gift card. Thanks for your inspiring posts. Look forward to your ideas each week. I love to see your posts. So many ideas and they all look wonderful! enjoy your blog, very inspiring. Love your porches! Love those pumpkin pillows! I’m making those Honeycrisp apples – YUM! Through your posts, I have learned so much about making a home beautiful, practical, and lovely. Thank you for the wonderful and informative posts. Love reading your blog…..great ideas. Thank you for the Pottery Barn gift card contest. I just Love Autumn,a palette of colors bursting forth! & the world goes on… I like your style! Porch decor,mantle,etc…u r a talented lady! ?? first let me say how much i enjoy your blog. Not just this post or that post, but all of your posts! Thanks for the motivation and encouragement. I love looking at your open selves and your lovely decorations. You’ve inspired me! Also, I so envy you Southern folks with the big front porches. What a wonderful opportunity to take seasonal decor to the outside so you can share it with your neighbors. Absolutely love that wire basket on top of the urn. This looks versatile and I’m sure it can be decorated for each season. Where on earth did you find that wire candle holder? Hi Gina. I found those wire candle holders at my local At Home store. Sure would love to win that gift card! And sure do enjoy your blog! Really enjoyed the before and after photo of your remodel. I love your fall urn. I love your porch decorating ideas for fall. I have 3 porches and always need fresh ideas. So excited with the results. Thanks you!! Honey crisp are my favorite apples—fall is all about apples & warm feelings of home! Thank you for your lovely blog. 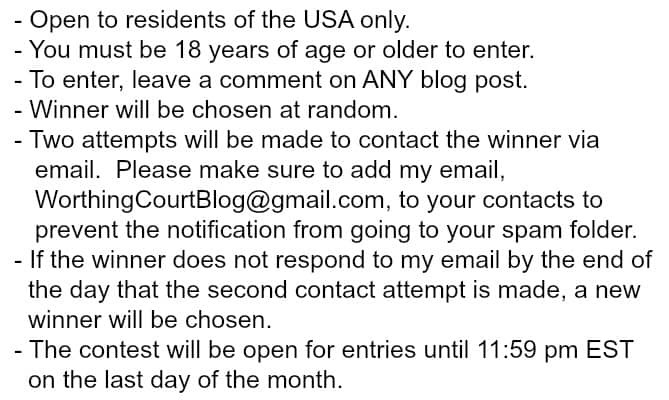 I love that I get entered to win just to comment on a post on a site I love to read anyway! Beautiful and very comforting!! Love your style!! Love your decorating style and love, love the wall shelf!! i love your warm gray spray paint color! had to go to 3 stores to get it, ha! trying to decide what to use it on. thanks for the info, as i love warm colors and i love gray. I really loved the porch with the large candle. You are so talented. Love decorating with pheasant feathers in the fall on table arrangements and then in wreaths at Christmas. I love your pretty fall decor and I hope to make the apple recipe soon. Love everything that you post on your blog!!! Also love Pottery Bard…. I just finished painting my living room this past weekend….whew, what a job with 14 foot ceilings! Anyhow, as I’m putting the room back together, I find myself thinking, wwsd? What would Suzy do? I referenced your blog for inspiration several times. So, thanks! I recently started following your blog and I am very inspired! Thanks for your great ideas and wonderful photos. I love your decorative approach to using different textures, and collections of items. Very pretty and calming. I read about 15 blogs . All decorating. Yours is my fravorite. I can use something from Worthing Court every day. Just finished my centerpiece, doing my outside urn filler today, and Apple dessert on Wednesday. I love your home. Please continue to make decorating like Pro so simple for those of us who need your help!! I recently started following your daily blog. I really enjoy your ideas and the changing of the season with you. Wow, Suzy, lovely as ever. Fall in your home I mean. Thank you for sharing your talents with us. I have learned so many decorating things from your blog. I hope to learn a lot more. Thank you. Great decor. Even better encouragement for me! The wall shelf in your dining room is so lovely and a great size. Thanks for the giveaway also. Thanks for the great giveaway! I really enjoy your blog and have been a longtime subscriber. I am looking forward to more holiday posts! Love all the fabulous Fall ideas! I love to look at your blog and see all of the great ideas. I’m still wanting those wire things in your front porch urns! Maybe I’ll get lucky and find some of my own! I love that fall wreath! I am absorbing all of the ideas to use in our new re-sale home for retirement! Such fun! Loved your blog …so many great ideas! Would love to win this gift! Your log is so inspiring! I look forward to it every day! I don’t miss a day without spending time on your blog. Your house makeover, room by room , is amazing. You sound as if you would be fun to be around. Oh please pick me! I LOVE Pottery Barn…..but who doesn’t? Love fall is here!! Love the photos and your porch is stunning!! Thank you for this offer! I’ve never been able to afford PB. It sure is appreciated. I do enjoy your blog and with the holidays approaching, a Pottery Barn gift card would be such fun. I appreciate your suggestions on fall decorating. I know what I like when I see it – I just have a very small imagination. Love your Fall decor. Hope to implement some of your great ideas in my own home! Thank you for a chance at an awesome giveaway! Goodness, I am so enjoying your makeovers and decorating tips. I have copied a few of them and should send you some pics. Thanks for sharing it’s nice to have some refreshing ideas to look at. I’d love to see some photos, June! Feel free to email them to me at worthingcourtblog@gmail.com. Love your decorating !! Always gives me ideas to try !! I so love your arrangement on the mantel in your dining room. And, I never would have the nerve to do what you did to your dining room furniture, and how beautiful that turned out!!! I need to follow your lead. I can’t believe what you have accomplished in 2 years!